* Camp Dolce campers will have classes on rhythm and movement, note-reading, and body percussion instead of chamber music coachings. ** Camp Grande, SSA’s new one-day adult camp, will include private lessons, orchestra, and workshops that cover music theory, learning by ear, and extended techniques. What’s SSA Summer Music Camp Like? SSA Camp is a small and tightly-knit community. The many faculty members pay each student a lot of individual attention. Whether the camper is a fresh beginner or a high school student who is going to pursue a college degree in music, the SSA faculty will tailor a unique learning experience for each individual’s needs. When SSA faculty members aren’t directly teaching they are often playing side-by-side with the campers during sectionals, orchestra rehearsals, and chamber music coachings so that the campers can also learn their instruments’ language through the experience of blending their sounds with very advanced players. Each camp session opens with a Faculty Recital and ends with a camper Orchestra Concert. 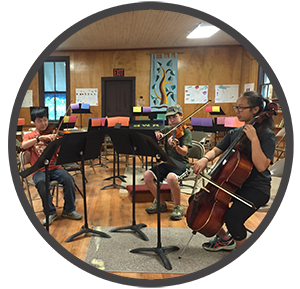 Camp Allegro, Camp Presto, and Camp Vivace will have a Chamber Music Concert (in which every camper will perform in a small ensemble without a conductor). Camp Vivace will also have a solo Honors Recital (campers will have the option to audition on a prepared solo for the Honors Recital during the first day of camp). Most afternoons the campers take part in a music workshop that brings them outside of the classical music realm. Past workshops have included Playing with a Garage Band, How to Arrange Pop Music, Jazz Improv, Fiddling, Music Theory Games, Rhythm and Body Movement, Song-Writing, and more. 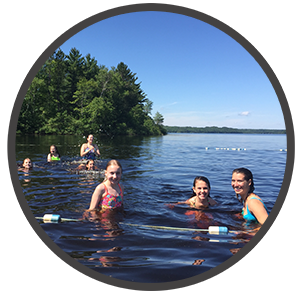 Between all the rehearsals, lessons, and practicing are many fun camp activities: writing cabin songs, swimming, playing field games, sitting around bonfires, performing in talent shows, and eating with the SSA gang during relaxing meal times. Everyone’s musicianship and personal development thrive in the infectiously positive energy that has become this camp’s trademark. a proud supporter of local music!